1874-2006 lbs. (850-910 kg) depending on model and tires. Taking on a hilly terrain means frequent braking. With Kubota’s light-step, wet-type disc brake you can stop quickly and effortlessly. Plus, its durability means there is no drop in performance due to wear. The frame is meticulously crafted from a high-intensity, lightweight metal and robotically welded for maximum reliability. This rugged frame structure can endure years of tough punishment. MacPherson Strut-type suspension on each of the front wheels, an independent suspension system, maximizes shock absorption as well as minimizes body tilt. No rubber belts allowed! Kubota’s exclusive high-performance, three-range VHT features more usable torque, steady acceleration, smooth engine-assisted deceleration, hill-holding abilities and Powertrain durability that no rubber-belted CVT can muster over the long haul. If you’re looking to maximize your carrying or towing performance, the VHT Plus2 is the solution to go with. Even while carrying a heavy load, the robust 21.6 hp, 3-cylinder, liquid-cooled Kubota D902 diesel engine can power you in, over and through the most rugged, off-road terrain. Features a full-length backrest and softer, more sculpted seat bottoms for better comfort. ROPS is a standard feature on theRTV900XT for your safety and protection and meets OSHA 1928.52 standards. Just as off-road driving requires split-second decision-making, Kubota RTVs respond just as quickly, equipped with hydrostatic power steering. 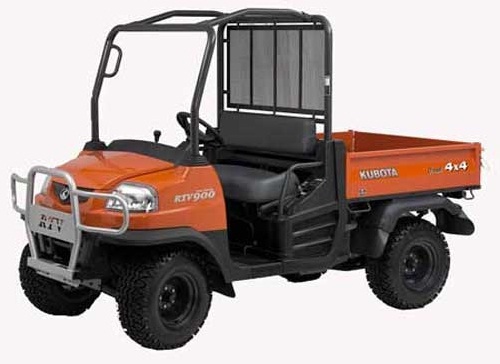 Unlike some competitive machines with decorative brush guards, the heavy-duty, reinforced steel of the Kubota’s from guard offers protection (this is an option on the RTV900XT General Purpose model). The standard hand throttle allows operators to increase and maintain engine ROMs while operating tools. These retractable seatbelts are easier to fasten and have an anti-cinch mechanism that detects excess shock and compensates accordingly. So you can keep your eyes on the road, the instrument panel has a convenient layout to let you monitor vital operating conditions in an instant. Monitor lamps include oil level, charge status and more. ON each rear wheel, the semi-independent suspension-type DeDion axle, the leaf spring and the shock absorber react together to minimize shocks on rough terrain. Metal fitting on the tailgate allows the gate cables to swivel which increases durability and reduces maintenance. no matter the load, you will securely haul in the extra-large cargo bed. A true hydraulic bed-lift system enables easy dumping with a single lever. (Optional on the General Purpose Model). Protect the bed and make hauling loads easier by ordering with the industry’s first factory installed spray-on bedliner.